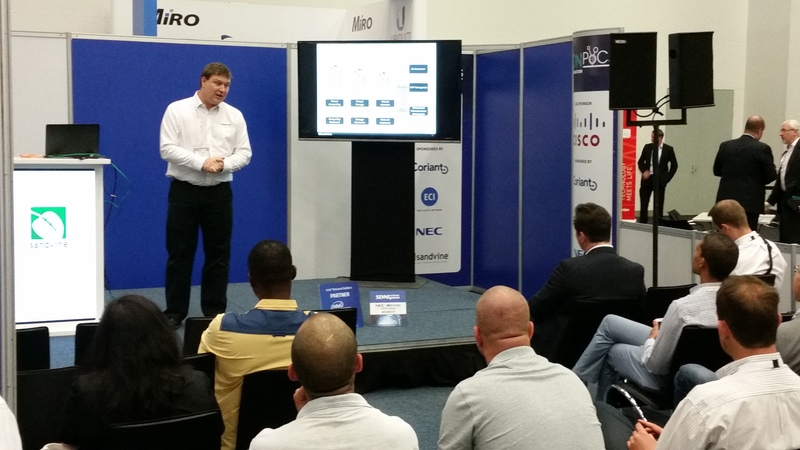 At AfricaCom 2015, we’re part of a proof-of-concept (PoC) program in which we’re showing off some pretty slick virtualization technology. You know, the cloud and all that. It turns out that the cloud is very heavy. From HQ to Cape Town I carried the equipment needed to showcase this PoC. These all fit (barely) into an (overflowing) laptop bag that weighs something like 15 kilos. I couldn’t really check all that stuff as luggage, because (a) we need it for our PoC, so I couldn’t risk it going missing; and (b) checked baggage goes missing…and it goes missing with a higher frequency when it’s full of laptops. So, I hauled that bag as carry-on through 34 hours of travel: three flights, and three separate security checkpoints (and yes, I got pulled aside). Why couldn’t we just ship the stuff over ahead of time? In addition to security/theft concerns (and customs is always a bit of a wildcard/variable), people were continuing to make tweaks to the demo (see this related post) throughout the week. We showed a very similar demo at a conference a month ago, and this one is the evolution of that one. And don’t get me wrong: the tweaks have improved the demo and made it even more compelling, but companies can’t always rely on someone physically carrying stuff down. Circumstances (e.g., weather, personal emergencies, etc.) can always conspire to prevent the equipment from being successfully carried. Oh, the HQ part, right: what does this have to do with HQers? Just like hearing about a demo failing is different than experiencing a demo failing, it’s easier to say “so and so can carry it” than it is to actually carry it. So, um, appreciate that it’s often a real pain to do so, and ingratiate yourself to all the remote folks by doing whatever you can to prevent hauling of stuff. Maybe you’ve got your own experience hauling demo equipment around the world? Great news, though, the demo worked flawlessly and impressively (onstage is Matt Farmer). ¹Fine, technically we weren’t there to show off the cloud, but rather OpenFlow-enabled low-bandwidth business services…but the cloud was involved so get outta my grill!